HDMI Extender Over Ethernet is based on TCP/IP standard. It transmit your HD display with the high resolutions up to 395 feet (120 meters) away from your HDMI or DVI-D source by using one CAT5e/6 cable. With the advantage of TCP/IP standard,you can extend your HD video to multiple displays by using an Ethernet Switch. Support point-to-point mode, one point-to-many mode and cascade connection mode. Support IR extender function allows IR remote control of Source devices from remote viewing location by sending IR commands received in the vicinity of the Display back to the Source devices. 2) Two pieces of 5V DC Power Supply. 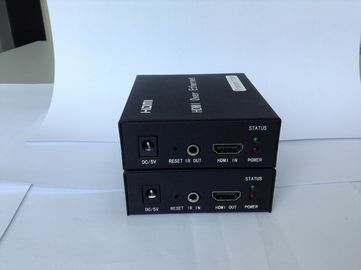 1) Connect the HDMI source (such as DVD, PS3, STB ) to the HDMI IN of Sender. 2) Connect the IR sender to the Sender IR OUT Port, and Be Directed at HDMI video source’s IR receiver. 3) Connect the HDMI out of Receiver to HDTV display. 4) Connect the IR receiver to the Receiver IR IN Port. 5) Use one Cat5e/6 cable up to 120m to connect the Sender and Receiver. 6) Plug two pieces of 5V power supply into the Sender and Receiver. 7) Power on the HDTV display and HDMI source.